Later I found a Tulsa World article explaining the bridge had been closed due to "weathering and rust." Worse yet, there seems to be no plan to repair it. The bridge was built in 1985 to provide children safer access to nearby Grimes and Nimitz schools. My wife likes to call it the "twirly bridge." Unfortunately, those unique ramps may be a part of its undoing. It was designed by local Tulsa architect, Charles Ward. Ward was one of the architects of the Tulsa Central Library, and he designed the iconic residence known locally as the Comma House. His pedestrian bridge design features circular ramps on each end. 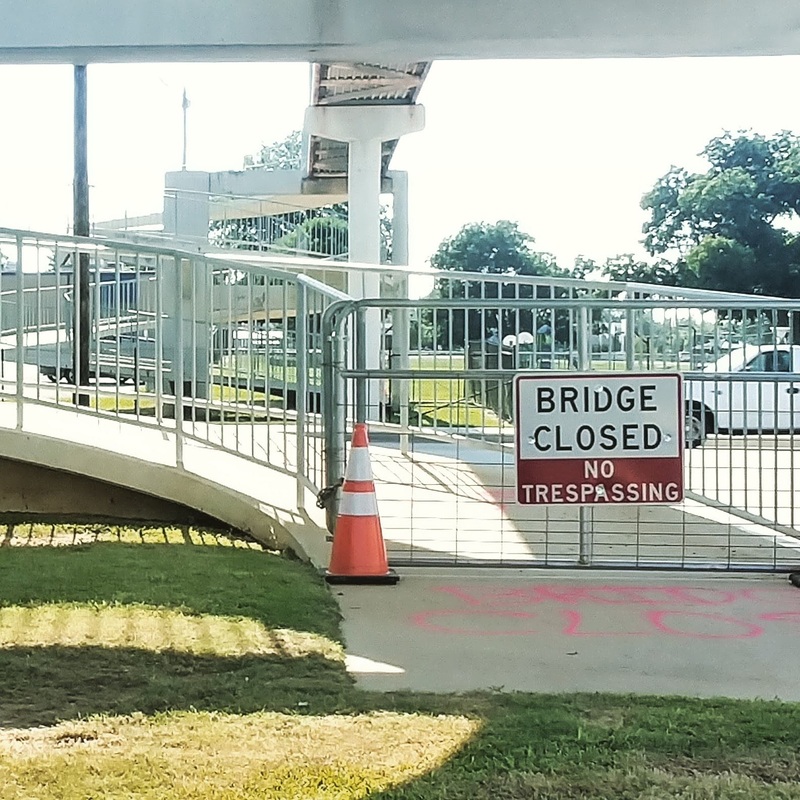 City officials cited lack of compliance with Federal disability access standards as one of the reasons to replace this bridge. Another problem, they claim, is a general lack of use. According to the World this was based on a one-day traffic study. It's a little perplexing that a bridge would require more accessibility- if no one ever uses it. But people do use it. Today it probably sees more running groups in the evenings than the waves of school children that walked across it in the Eighties. A more thorough observation would prove the bridge sees much more traffic than officials claim. 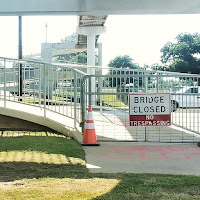 The City seem to have made a snap decision to demolish this bridge without any consideration for rehabilitation or preservation of the structure. Sad. This bridge is a unique landmark in a world of increasingly generic cityscapes. The fact it can still serve a purpose with a little TLC seems like a win-win.